Houghton Mifflin Harcourt Co., the Boston-based education content provider, became a public company today, offering 18.3 million shares of its stock at $12 per share. By midday, the stock price had hit a high of $15.96 per share. Trading with the ticker symbol HMHC, the company is listed on the NASDAQ stock exchange. 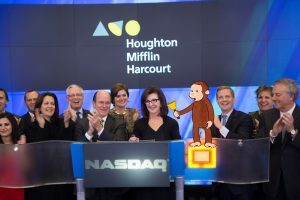 Houghton Mifflin Harcourt’s CEO Linda Zecher rang the bell in New York to start trading this morning. The initial public offering of stock “increases our access to capital markets and provides sources of funding we might want to use for future growth,” Mary Cullinane, the company’s chief content officer and executive vice president of corporate affairs, said in a phone interview. It also affords “a greater level of transparency to our customers and public about who we really are …[with an awareness that] the same company that produces Curious George and Martha Speaks also … produces the Johnny Carson biography and Go Math! program,” she said. When a company goes public, the transparency to an increased number of shareholders can also increase the pressure on its executive team to produce short-term quarterly results for those stockholders. Asked about that, Cullinane said Zecher’s history of working for and leading public companies is an advantage. “We believe, as a management team, that you always have to take the long-term view,” Cullinane said. “This is the first step in a very long journey; we recognize that there will be highs and lows” along the way. Last year, during an earlier part of its financial journey, the company emerged from bankruptcy. In June 2012, a judge approved Houghton Mifflin Harcourt’s restructuring under Chapter 11. At that time, creditors holding 70 percent of the company’s debt agreed to eliminate $3.1 billion in debt in return for ownership stakes in the business. In August, Houghton Mifflin Harcourt filed with the Securities and Exchange Commission to go public. In today’s IPO, shares are being offered solely by existing stockholders—including Paulson & Co., hedge fund manager John Paulson’s investment firm. HMH will not receive any of the proceeds of the offering. The Boston Business Journal reported in July that the company’s goal is to double the percentage of its $1.3 billion in annual revenue that comes from digital sales. Zecher wants half of HMH’s sales to be digital within the next 18 to 24 months. Cullinane said those sales are 27 percent of revenue today. The Wall Street Journal recently reported on Houghton Mifflin’s IPO, highlighting its challenges from a variety of digital upstarts. Earlier this year, we reported on how the “big three” publishers in education—Pearson, McGraw-Hill, and Houghton Mifflin Harcourt—are rethinking their strategies in the wake of a fragmented market and growing demand for digital delivery of content.